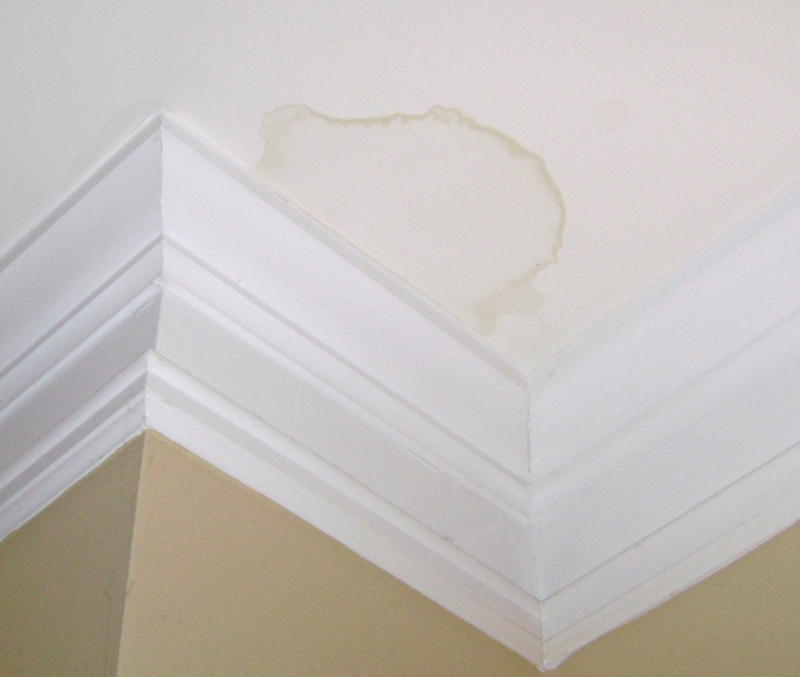 A spot on your ceiling most always prompts the thought of a roof leak which can be a dreaded thought to most. Many times in the winter or summer months it is due to condensation. A spot on the ceiling that looks like a roof leak could be from an A/C duct. When there is a leak that causes the cold air to meet the hot air in the attic you are sure to see a water stain on your ceiling. We have even seen this on cathedral ceilings. The drywall has a gap that allows air conditioning or heat to escape. Moisture is created when the leaking air meets the outside temperature under the roof deck. The water from this moisture drops to the ceiling and a stain begins to show. The same occurs with bathroom fan vents. If the hose is not installed with a pea trap there will be water that falls back down causing a stain. Shower pans that are also a source of leaks. As they age the mortar cracks and so does the shower pan. This is very common in older homes. 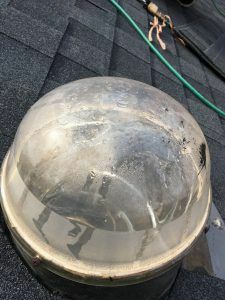 Skylights and solar tubes have seals that breakdown over time. The inside air temperature can escape to meet the outside temperature and condensation is created. See the photo below of a classic example of this situation. When you see a water stain on your ceiling give the previous information some thought. You may save your self a service call by doing some basic steps to narrow down what type of contractor you need to fix the problem. Otherwise, give a local factory certified roofing contractor a call. 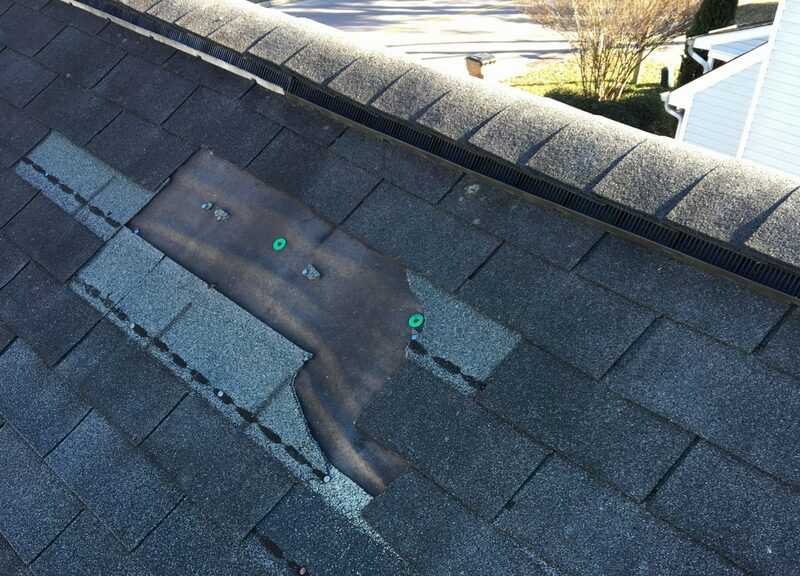 A roofing company with trained technicians can help navigate where the water is coming from. A trained roofing contractor can help you find your way to the solution. A spot on your ceiling most always prompts the thought of a roof leak. Many times in the winter or summer months it is due to condensation. A spot on the ceiling that looks like a roof leak could be from an A/C duct. A spot on your ceiling most always prompts the thought of a roof leak which can be a dreaded thought to most. Many times in the winter or summer months it is due to condensation. A spot on the ceiling that looks like a roof leak could be from an A/C duct.